The 2014 Local Elections were good elections in general for the smaller left of centre groupings, but especially for the two largest parties/alliances within these groupings – the People Before Profit Alliance and the Anti Austerity Alliance. Both of these won 14 seats on different City or County Councils across the state, leaving them with the fifth joint largest representation levels of any party/grouping at the local authority level across the state. Running 43 candidates (four more candidates than the Anti Austerity Alliance did), the People Before Profit Alliance won 29,081 votes across the state, amounting to 1.7% of the first preference votes cast nationally. In the forty constituencies that they contested, the People Before Profit Alliance won 5.2% of the first preference votes cast in these. 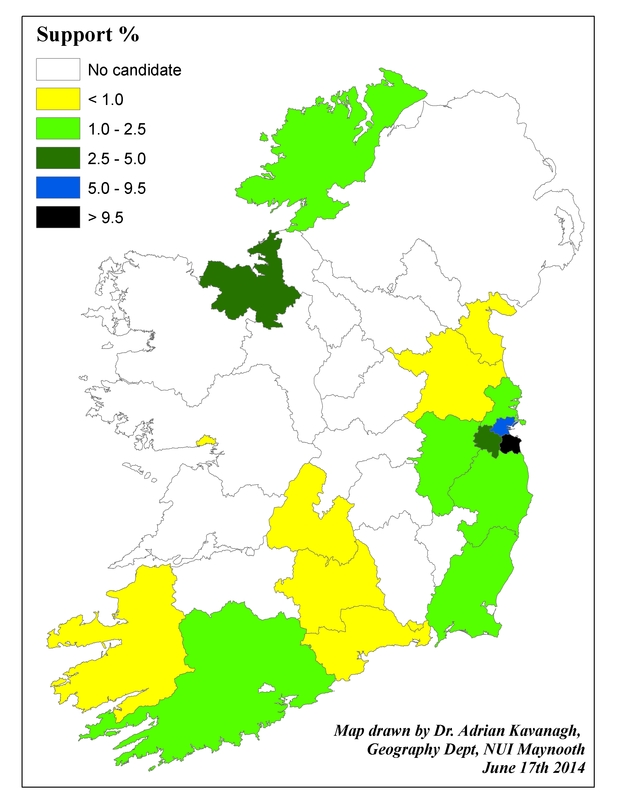 The People Before Profit Alliance candidates fared better in Dublin than they did in the other regions (see Figure 1 above), winning 6.0% of the votes cast in Dublin as against support levels of 0.7% in Leinster and 0.5% in both Munster and Connacht-Ulster. The bulk of the People Before Profit seats were won in Dublin (12), with the only two seats won outside the Dublin region being won in Wexford and Sligo. At the local authority level, the People Before Profit Alliance won nearly ten per cent of all the votes cast in Dun Laoghaire-Rathdown (9.8%), with the next best result coming in Dublin City (6.9%).The best result at a local electoral area was won in Killiney-Shankill, where the People Before Profit Alliance won 21.8% of the first preference votes cast there, followed by Ballyfermot-Drimnagh (16.6%), Dun Laoghaire (14.9%), Clondalkin (12.0%), Crumlin-Kimmage (11.6%) and Beaumont-Donaghmede (10.6%). 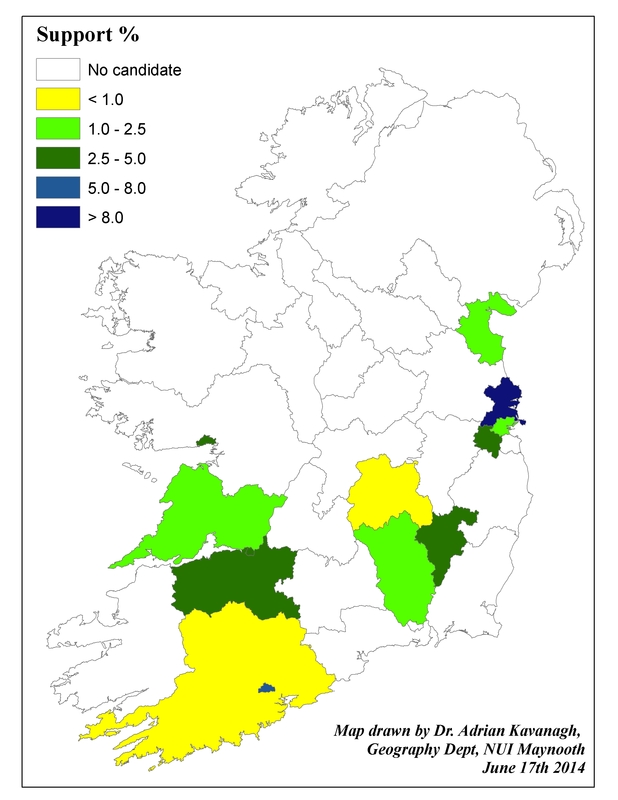 39 candidates contested the 2014 Local Elections as part of the Anti Austerity Alliance; while almost half of these (19) were based in the Dublin regions, a good number of Anti Austerity Alliance candidates were also based in Cork (4), Galway City (3) and Limerick (6). As well as running fewer candidates, the Anti Austerity Alliance contested fewer constituencies (26) than the People Before Profit Alliance did. 21,110 votes were won by these Anti Austerity Alliance local election candidates across the state, amounting to 1.2% of the first preference votes cast across the state. The grouping did fare much better on average in Dublin (3.2%) (but fared even better in some of the other City Council areas) than they did in the other regions of Munster (1.3%), Leinster (0.4%) and Connacht-Ulster (0.3%). At the local authority level, the strongest Anti Austerity Alliance performance came in Fingal (8.0%), followed by Cork City (5.9%), South Dublin County (4.6%), Galway City (4.5%) and Limerick (4.4%). The best Anti Austerity Alliance performance at the electoral area/constituency came in Cork City North Central, where a 27.7% vote share ensured that two Anti Austerity Alliance seats were won. Two seats were also won in Mulhuddart (where 26.3% of the first preference votes was won) and Tallaght Central (where 22.5% of the first preference votes went to the Anti Austerity Alliance). The next best performances after Mulhuddart, Tallaght Central and Cork City North Central came in Tallaght South (11.5%), Limerick City North (9.6%), Cork City North West (9.3%) and Limerick City East (8.3%). At the Dublin European Elections contest, sitting MEP Paul Murphy (Socialist Party/Anti Austerity Alliance) won 29,953 first preference votes (8.5% of the votes), leaving him in sixth place on the first count, and Brid Smith (People Before Profit Alliance) won 23,875 votes (6.8%). While neither candidate was in serious contention to win a seat at any stage during the counts (although Murphy did move within 2,474 votes of Nessa Childers on the 3rd Count following the distribution of Brid Smith’s preferences – he won 31.3% of these), the extent of their transfers to Nessa Childers helped her to take the second seat in this constituency. The most striking result of any candidate from these two alliances/groupings of course came at the Dublin West by-election, where Ruth Coppinger won the seat for the Socialist Party, winning 5,977 first preference votes (20.6% of the valid poll). Although her share of the vote was down slightly down (0.5%) on her share at the 2011 by-election contest, this vote left her in second place on the first count, just 79 votes behind the poll-topper, Sinn Fein’s Paul Donnelly. Strong transfers over the following counts, especially from the left-of-centre candidates, edged her ahead of Donnelly and ensured she was well ahead (3,097 votes) of Fianna Fail’s David McGuinness by the final count. This entry was posted in by-election, European Elections, Local Elections 2014 and tagged 2014, Anti Austerity Alliance, People Before Profit Alliance. Bookmark the permalink.